The author of Give War and Peace: Tolstoyan Wisdom for Troubling Times and Russian for Dummies, Dr. Andrew Kaufman is a well-known professor at the University of Virginia who has appeared on a number of television programs and talk shows to discuss the importance and relevance of Russian literature. One of his most famous courses is "Books Behind Bars," in which university students discuss works of Russian literature with juvenile detention residents in Virginia. The course has been described as a life-changing experience by both university students and former residents. The American-Russian Cultural Cooperation Foundation is thankful to Dr. Kaufman for not only promoting Russian culture in the United States, but also making the reintegration process easier and more rewarding for former residents, now equipped with the wisdom of Tolstoy, Dostoyevsky, Chekhov, and other Russian authors. ARCCF would also like to express its gratitude to Dr. Kaufman for participating in its 2016 gala "America and Tolstoy: A Dialogue from Quill to Tweet." Dr. Kaufman's electrifying speech about the importance and relevance of Tolstoy's ideas in today's world received a thundering ovation from the audience. You can lend your support to the completion of the film about Dr. Kaufman's program by going to http://rosaliafilms.com. The Russian Chamber Art Society will celebrate the opening of its 11th season with a magical Gala concert of excerpts from the opera Eugene Onegin, featuring Yana Eminova (soprano), Magdalena Wor (mezzo-soprano), Timur Bekbosunov (tenor), Timothy Mix (baritone), Vera Danchenko-Stern (piano), Genadi Zagor (piano), and Rick Foucheux (narrator). Tchaikovsky's famous opera brings to life the immortal love story written by beloved Russian poet Alexander Pushkin. Enjoy the artistry of these performers amid the delightful surroundings of the French Embassy. General admission tickets of $150 include the concert, a buffet dinner, dessert, and an open wine bar. VIP tickets of $190 also include a wonderful pre-concert champagne reception. Evening concludes with a surprise "FUNale." To buy your tickets online, click Purchase Tickets below. For more information, please call 703-354-7354. The experimental side of the Bolshoi Theater is revealed in these screenings of select groundbreaking dance and opera productions from the past decade, all filmed in high-definition. Most screenings include Q&A with Katerina Novikova, Press Secretary of the Bolshoi Theatre and BRAI's Anna Winestein. Other guests include professors Joseph Auner and Harlow Robinson, and choreographers David Parker, Rebecca Rice, Peter di Muro. You're receiving this message because you subscribed to the Ballets Russes newsletter. Changed your contact details? Update them here. Don’t want to hear from us anymore? Unsubscribe Instantly. "Stars of the Russian Chamber Art Society"
Attention: Lovers of Russian singing! 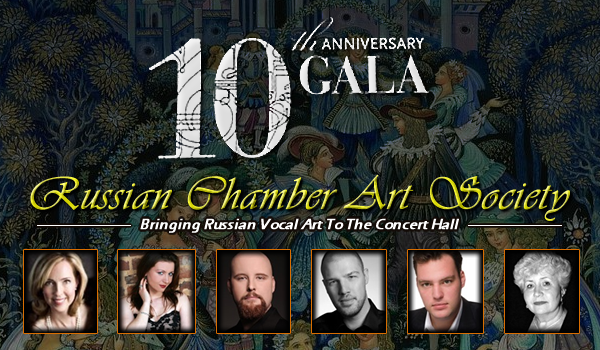 You are invited to a gala celebration of the Russian Chamber Art Society's Tenth Anniversary as the leading presenter of Russian vocal music in the nation's capital. Please join us at the Embassy of Austria for "Stars of the Russian Chamber Art Society," a festive evening featuring performances by some of your favorite RCAS singers - among the most captivating young performers of the Russian art-song repertoire - and four special guest instrumentalists. Singing classic romances by Tchaikovsky, Rimsky-Korsakov, and Rachmaninoff, as well as 20th-century songs by Georgy Sviridov, Rodion Shchedrin, and Valery Gavrilin, will be soprano Jennifer Casey Cabot, mezzo-soprano Magdalena Wor, tenor Nils Neubert, baritone Timothy Mix, and bass Grigory Soloviov, accompanied by pianist Vera Danchenko-Stern, RCAS founder and artistic director. Also performing will be Victor Danchenko, violin; Julian Milkis, clarinet; Tamara Volskaya, domra; and Anatoly Trofimov, accordion. General admission to the Gala is $150, which includes a buffet dinner, dessert, an open wine bar, and a silent auction. VIP ticket holders at $190 receive an additional exclusive pre-concert champagne reception at 7:00 pm. Why limit your love to Valentine's Day? Make a date for February 27, 2015, the first concert of 2015 for the Russian Chamber Art Society, for an evening to remember! Held at the Embassy of Austria, this exciting and diversified collection of Russian vocal and piano music will warm your heart and launch your imagination. Grigory Soloviov, bass; Alexander Shtarkman, piano; and of course, Vera Danchenko-Stern, piano. A dessert and wine reception follow the performance to sweeten the evening even more. Order today - our last concert was sold out!